Welcome to India, You will be received by Premium India Tour representative at international airport, he will be waiting for you, by holding you play card in his hand. He will assist you to check in your hotel. In the Hotel you will have a brief description of your tour and the representative will hand over you documents regarding the tour, Overnight in Hotel. 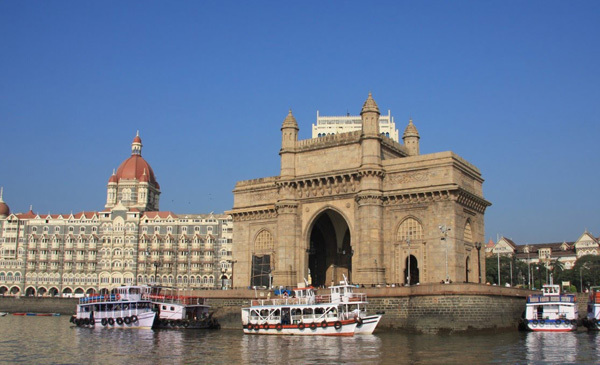 After breakfast takes a sight seeing tour of Bombay, drive to Gateway of India and from here cruise by motorboats to Elephanta Caves. A flight of 100 steps takes you to the top of the hill where it is set. The caves houses large pillars that seem to hold the ceiling which is made of cross beams. The picturesque presentations of the 9 marvelous sculptured panels, set on the walls are awe-inspiring. The most famous of the panels is the Trimurthi, or triple-headed Shiva, where the God is depicted as the destroyer, the preserver and the creator. Later visit Prince of Wales Museum, Parliament House, Marine Drive, Jain Temple, Hanging Gardens, Return back to the hotel for overnight. After breakfast, drive for Lonavala, a picturesque hill station near Mumbai. Check in hotel and later visit Karla & Bhaja Caves, Overnight in Hotel. Morning breakfast at leisure, rest of the day is free to explore beautiful surroundings around Lonavala. From here visit Khandala (5 km 15 min) to see the Bhushi Dam; enjoy lunch at Amber hotel, overnight at hotel. Leisure Breakfast at hotel, drive to Matheran. Later in the day you explore the beautifully tranquil surroundings. Visit different viewpoints like Chouk, Garbut Point, Panorama, Louisa, Echo. Overnight at hotel. After breakfast drive to Aurangabad by road. On arrival transfer and check into the hotel. Aurangabad has some of the most elaborate vase temples of India. There are 34 caves - 12 of them of Buddhist origins (Ad 600-800), 17of Hindu origins (around AD 900) and are numbered in that order from south to North. After relaxation at hotel visit Daulatabad Fort. Later visit Bibi ka Maqbara, which is the tomb of Begum Rabia Durani, wife of Emperor Aurangzeb. This is a replica of the Taj Mahal. Next we visit Panchakki, a water mill, famous for its underground water channel traversing more than 8 km to its source away in the mountains. Later return to the hotel for overnight stay. After breakfast we go on a sight seeing tour of Ellora, a UNESCO world heritage site. It houses 34 monasteries and temples that date back from 600 to 1000 AD. The temples of Ellora are dedicated to Hinduism, Jainism, and Buddhism. The architectural marvel of the monolithic Kailasa Temple is of particular interst. The Buddhist Vishvakarma Chaitya and Vihara, the Yakshi statue and ceiling paintings are to be noted. Overnight at Hotel. After breakfast on day 10 of best of Maharashtra tour, take an excursion to the famous Ajanta caves. Recognized as a World Heritage Site by UNESCO, it was discovered by a group of British officers during the 19th century; they were on a tiger hunt. The Ajanta group of caves depicts the story of Buddhism during 200 BC to 650 AD. Ajanta's cave temples are cut into a dramatic crescent-shaped gorge, headed by a waterfall that drops over the mountain in seven steps into a pool. The caves cover a span of 800 years narrating in the murals, the story of Buddha in his cycle of incarnations, while also creating a painted record of the panorama of life in ancient India. The paintings are immortal in their stylized beauty and magical eloquence. Later we drive back to Aurangabad and checkout the hotel and proceed towards Pune. On arrival check in hotel and overnight at hotel. Take a sightseeing tour of Pune visiting Raja Kelkar Museum, Saras Bagh, Kasturba Smarak (Inside Agha Khan Palace) and Shaniwarwada. Rest of the day free for relaxation; spend it as you wish. Overnight at Hotel. Early morning we drive to Mumbai and later get you transferred to the international airport to board the scheduled flight back home.